Facebook is the most popular online social media and social networking service. The fact is, almost each aspect of our daily lives is mirrored on the Facebook. For some it is an addiction, while for some it is an obsession. Every user knows how to use Facebook to its full potential. Almost everybody using the Internet, barring few exceptional cases, have a Facebook profile. I have often heard people say how they traced their kindergarten friends on Facebook. Sounds so good and great, right? So how do others without a Facebook account trace their kindergarten mates on Facebook? 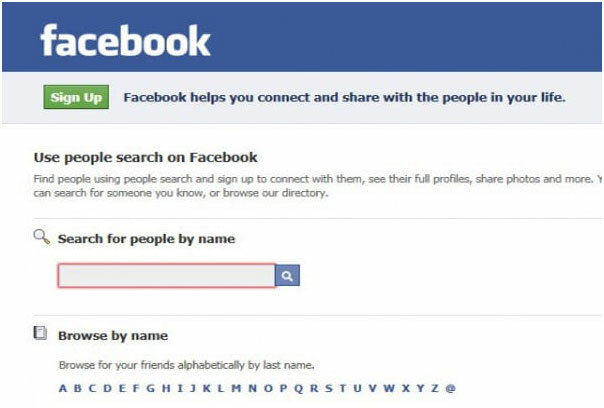 There are a few options that help you search for someone on the Facebook without having to create an account to login. Before you start the search you must remember that many members opt for the search privacy settings. In such cases the member’s details will not be displayed on the public search results page. It is a precautionary measure to prevent non Facebook members from accessing a member’s personal details. Facebook Directory is very similar to the yellow pages because it lists all the people who are active Facebook users. You can search for people by typing their Facebook profile names in the search box or you can browse for people alphabetically by their names. The directory also lists pages with maximum fans and places with maximum check-ins. Using the URL – https://www.facebook.com/directory/ you can search for a person on the Facebook Directory without having to log in. The search results page display the matching list of names that you are looking for. The People Search page on Facebook is its own official search page. You can type in the name of the person you are looking for and the search result displays a list of profiles with the same name. Identify the one that you are looking for and “happy connecting” with a long lost friend! However, if you have failed to find the person you were looking for, you can further narrow down the search. You can provide additional details like city, school, college etc. If you still did not succeed, then maybe the person has masked all personal details. So how about creating an account on Facebook and start looking again? Social Searcher is a free Social Media Search Engine that allows you to search for people and content in various social networks. You can search for people without logging in or for publicly posted information by them on the various social networking sites including Facebook. The search result displays the matching account names along with their recent activities from different social networking sites. Whenever you ask a friend or a relative for a specific information, the immediate response is “Google it”. Similarly, you can use Google search to look for someone on the Facebook. For an accurate Google search result, provide the following search string: site: facebook.com Name. Ensure that you replace the “Name” in the string with the actual person’s name you are looking for. The search result displays all the matching profiles. Clicking on a specific profile redirects you to the People Search page of Facebook. Another popular search option to look for someone on Facebook is the Browser Add-Ons. There are quite a few add-ons available that you can download for free and search for people on Facebook without logging in. Listing all the add-ons in this article is not feasible. However, I will provide a brief introduction to the two most popular add-ons. It is Firefox add-on that you can use to search for people on Facebook without logging in. It is a Chrome extension which can also be used to search for people on Facebook without logging in. Using the methods above, you can find people, pages, group or other relevant details on Facebook. But to connect, share, comment etc. you have to create a Facebook account.